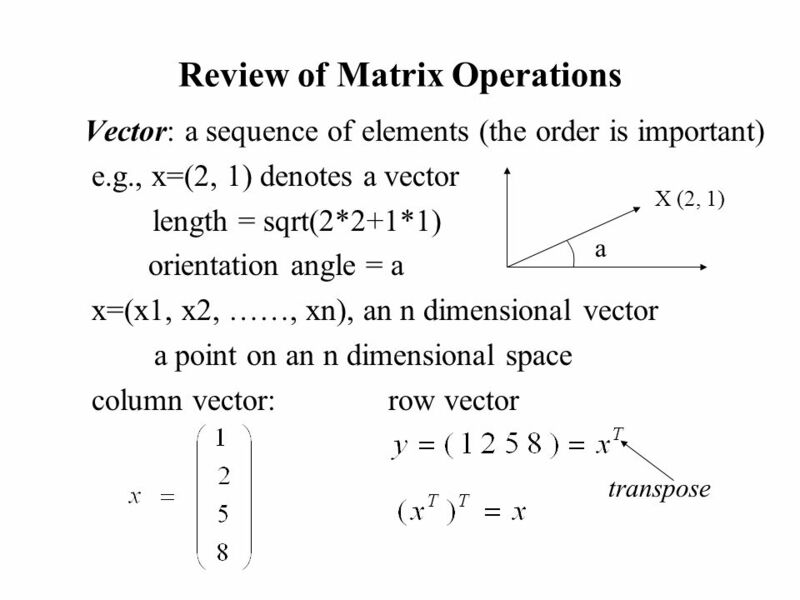 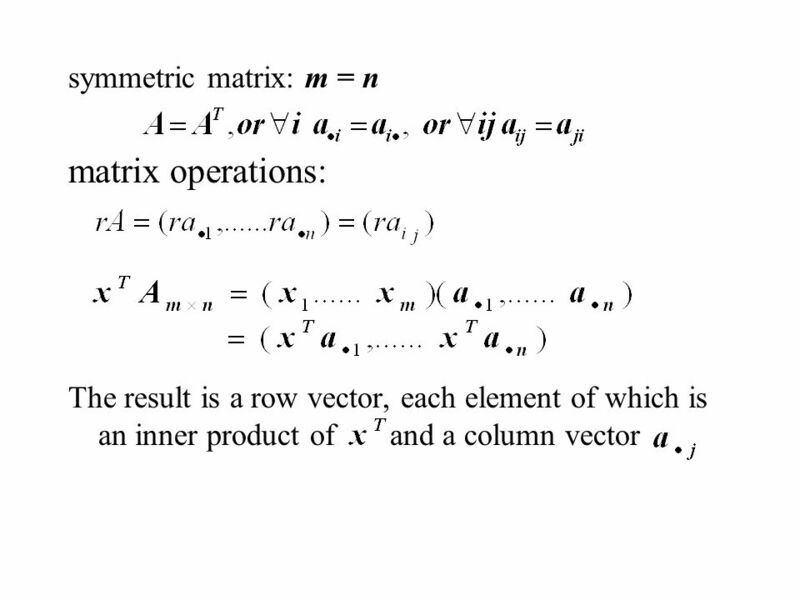 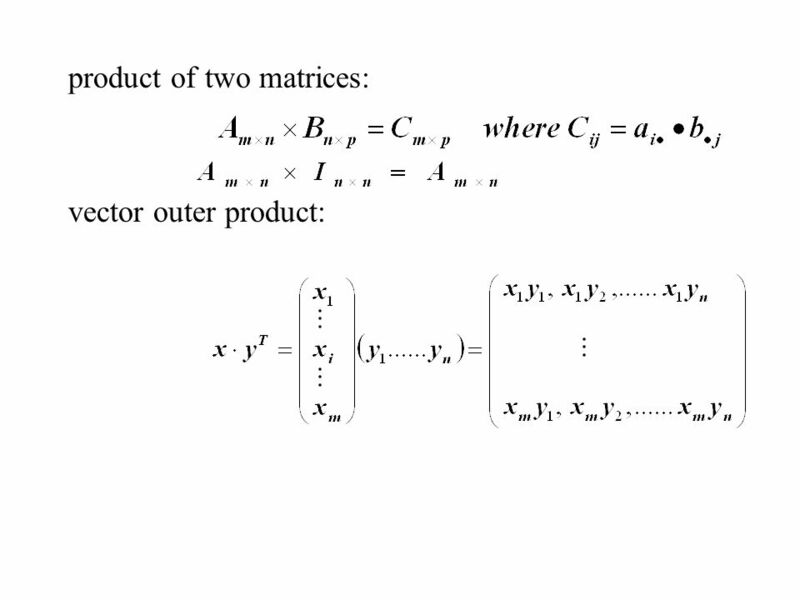 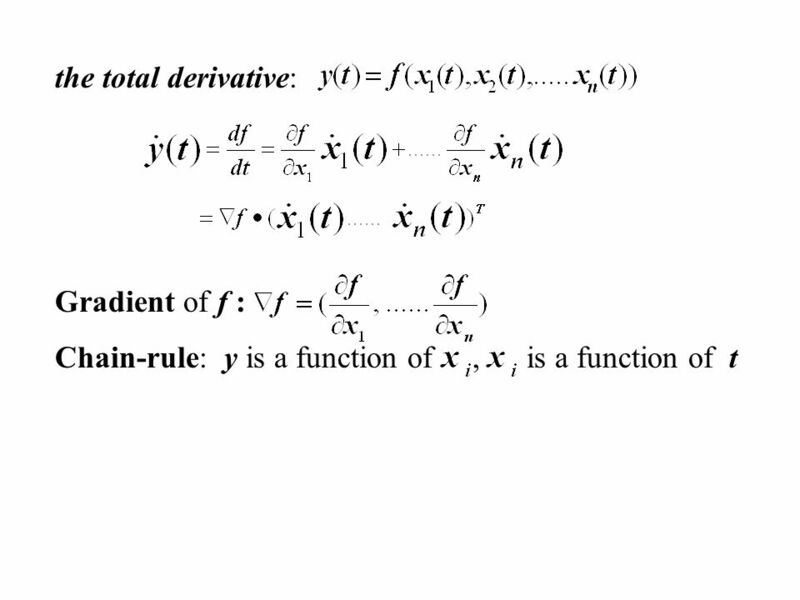 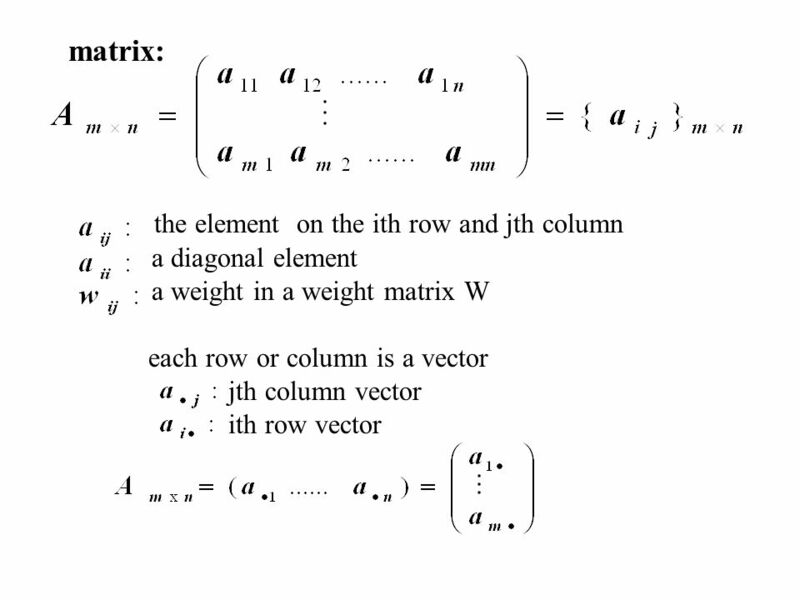 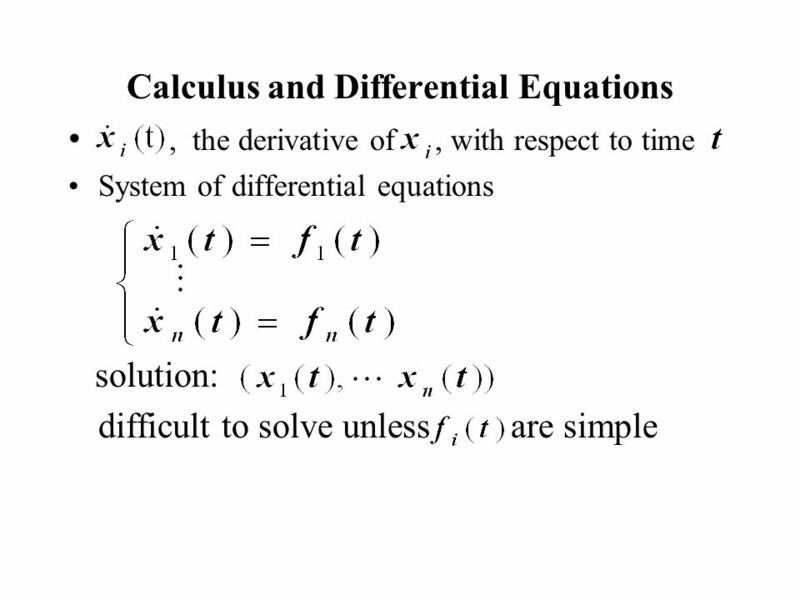 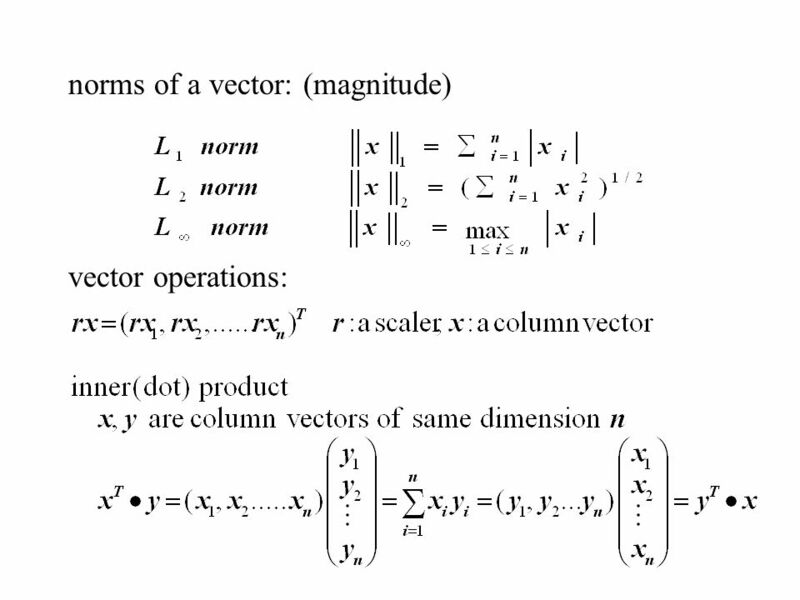 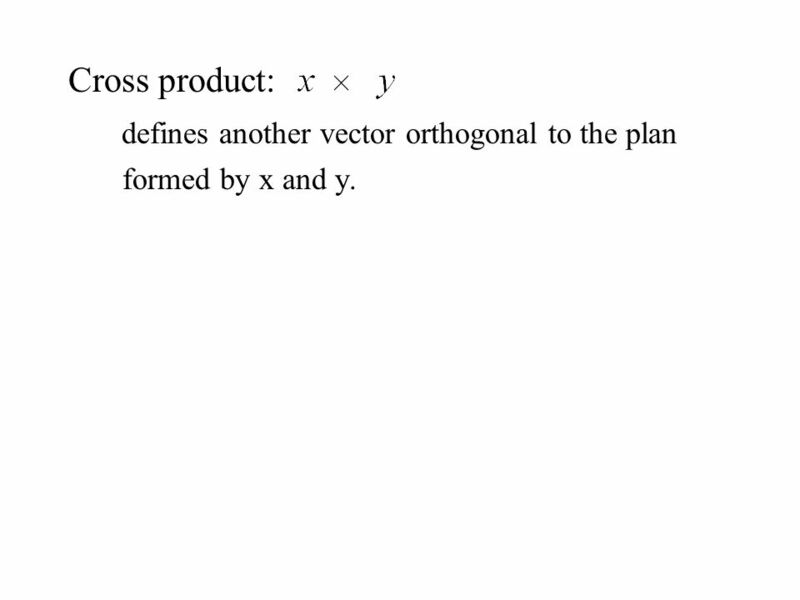 Cross product: defines another vector orthogonal to the plan formed by x and y. 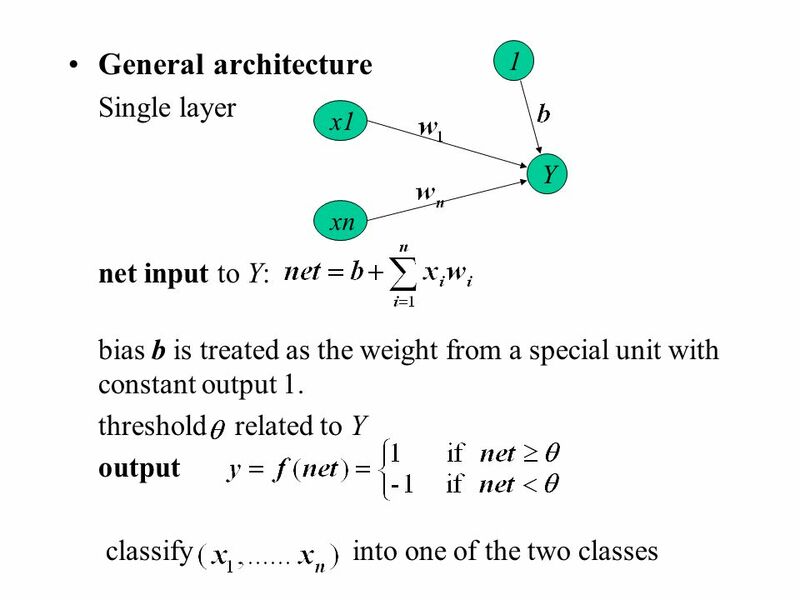 21 If n = 3 (three input units), then the decision boundary is a two dimensional plane in a three dimensional space In general, a decision boundary is a n-1 dimensional hyper-plane in an n dimensional space, which partition the space into two decision regions This simple network thus can classify a given pattern into one of the two classes, provided one of these two classes is entirely in one decision region (one side of the decision boundary) and the other class is in another region. 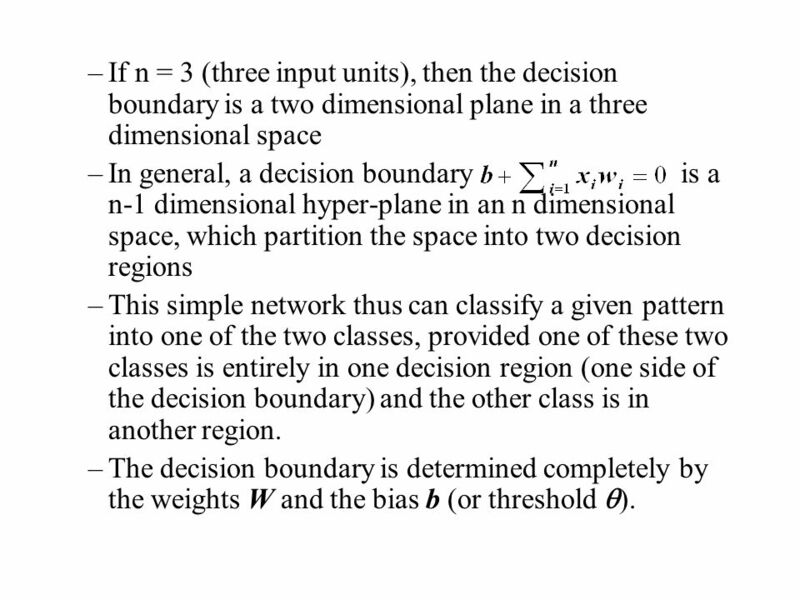 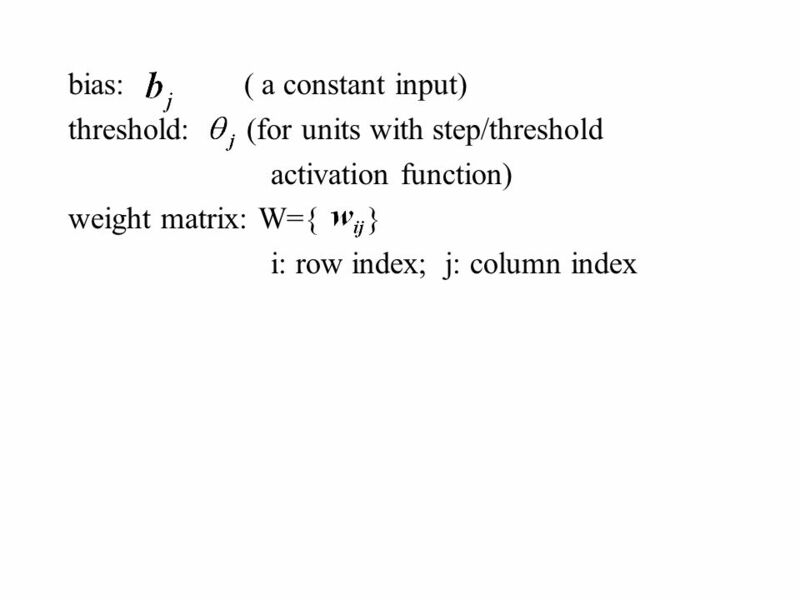 The decision boundary is determined completely by the weights W and the bias b (or threshold q). 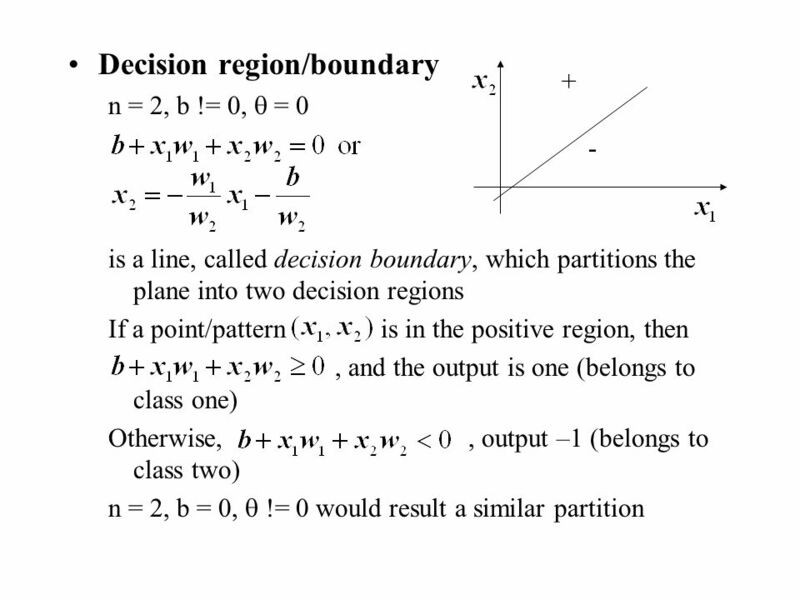 If two classes of patterns can be separated by a decision boundary, represented by the linear equation then they are said to be linearly separable. 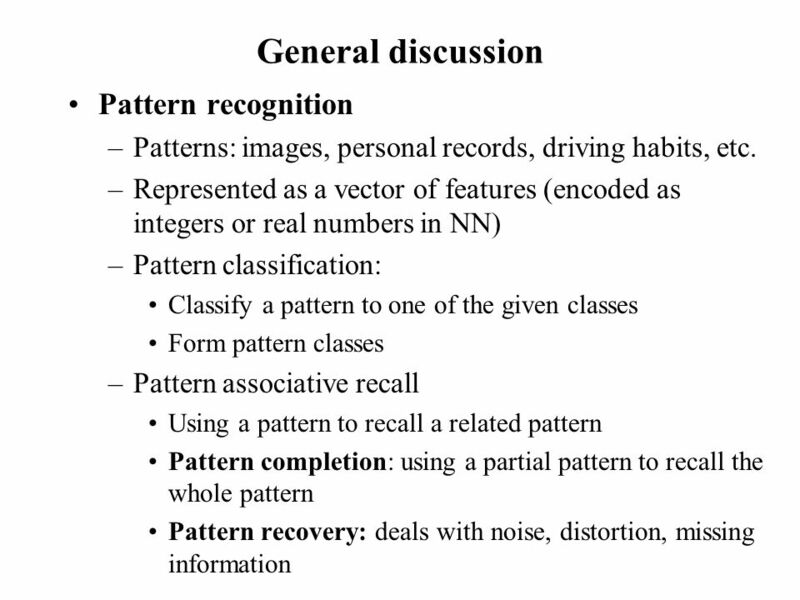 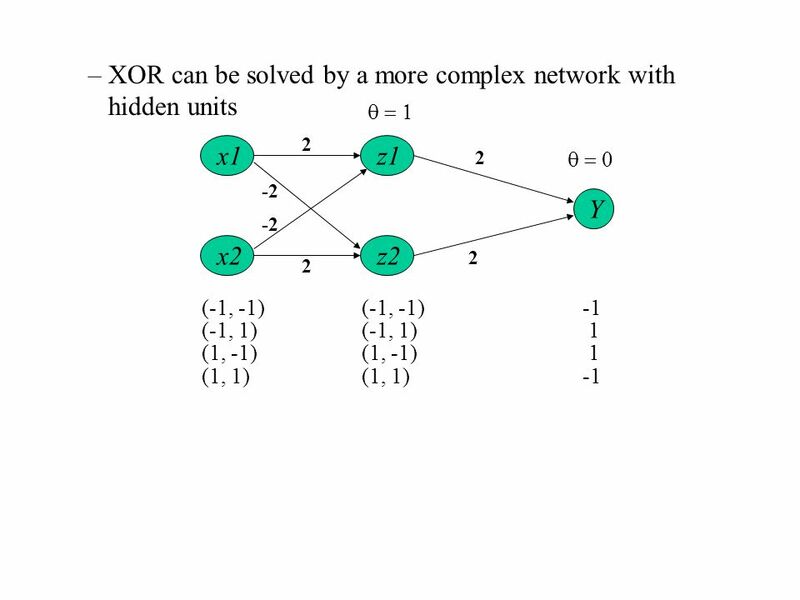 The simple network can correctly classify any patterns. 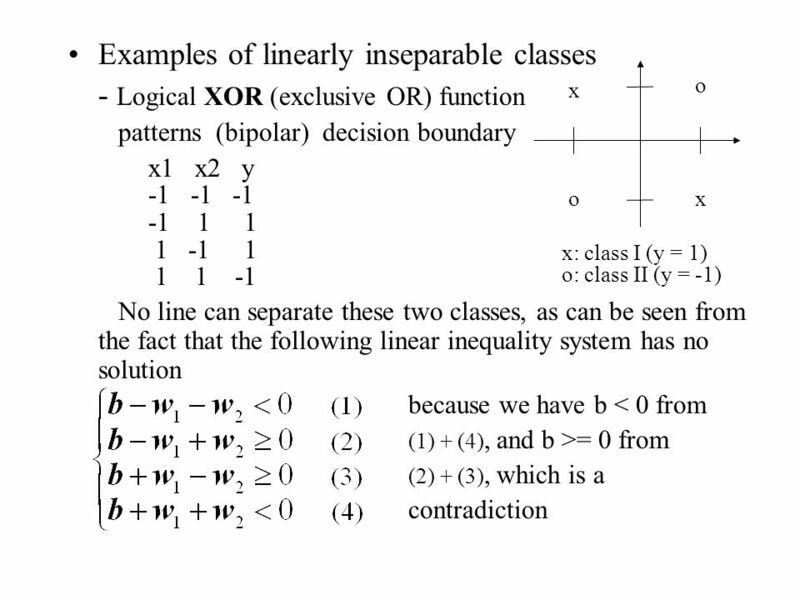 Decision boundary (i.e., W, b or q) of linearly separable classes can be determined either by some learning procedures or by solving linear equation systems based on representative patterns of each classes If such a decision boundary does not exist, then the two classes are said to be linearly inseparable. 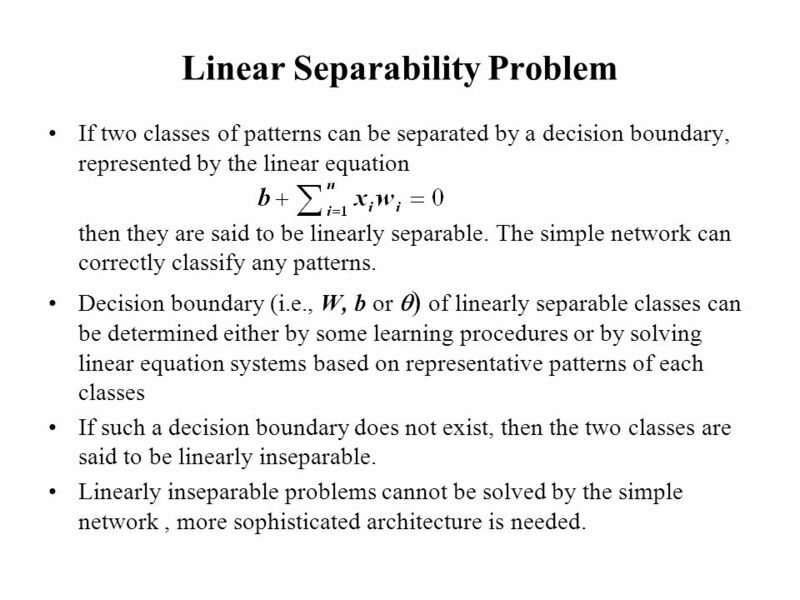 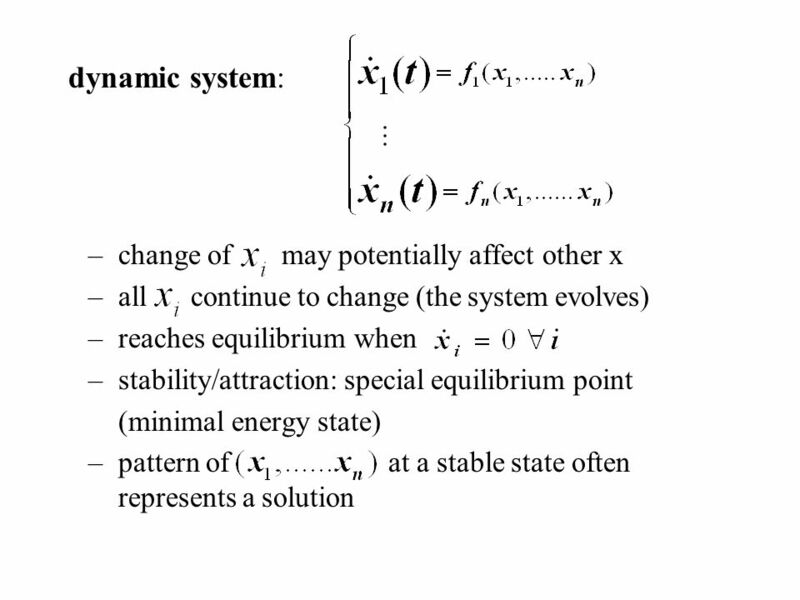 Linearly inseparable problems cannot be solved by the simple network , more sophisticated architecture is needed. 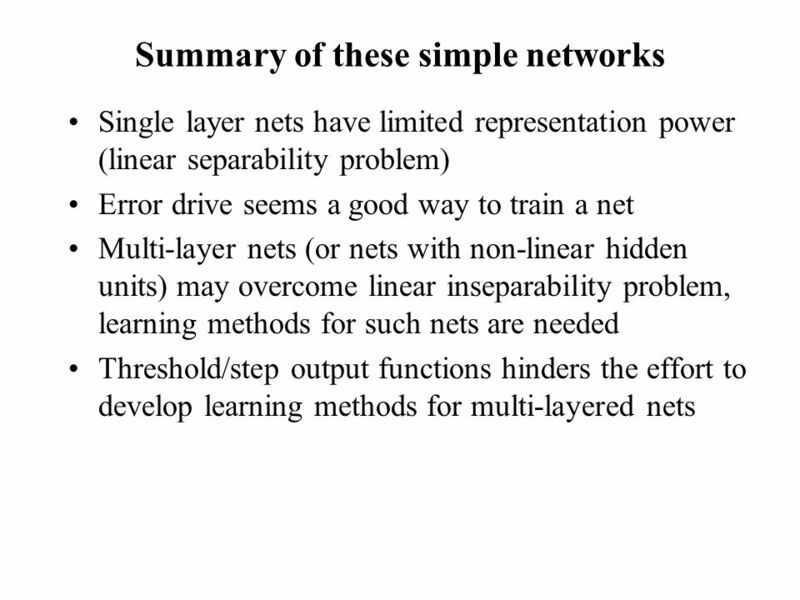 28 Stronger learning methods are needed. 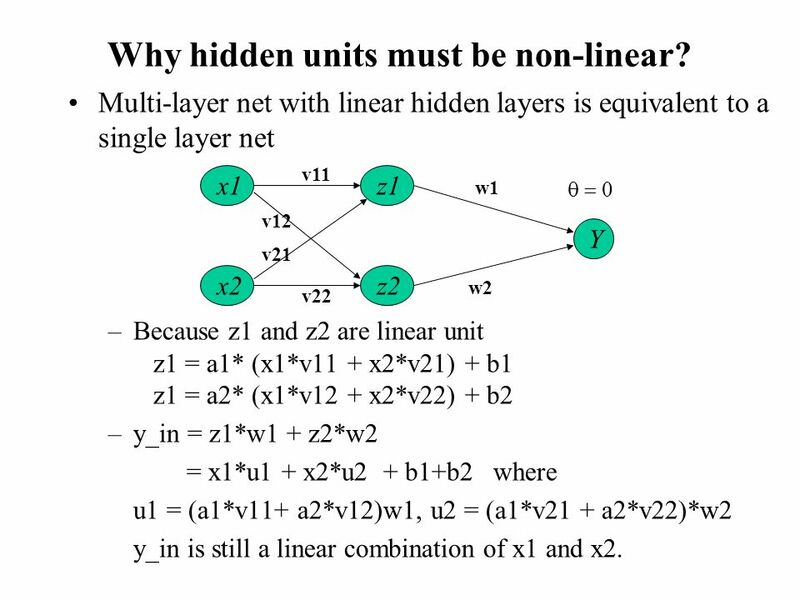 36 Why hidden units must be non-linear? 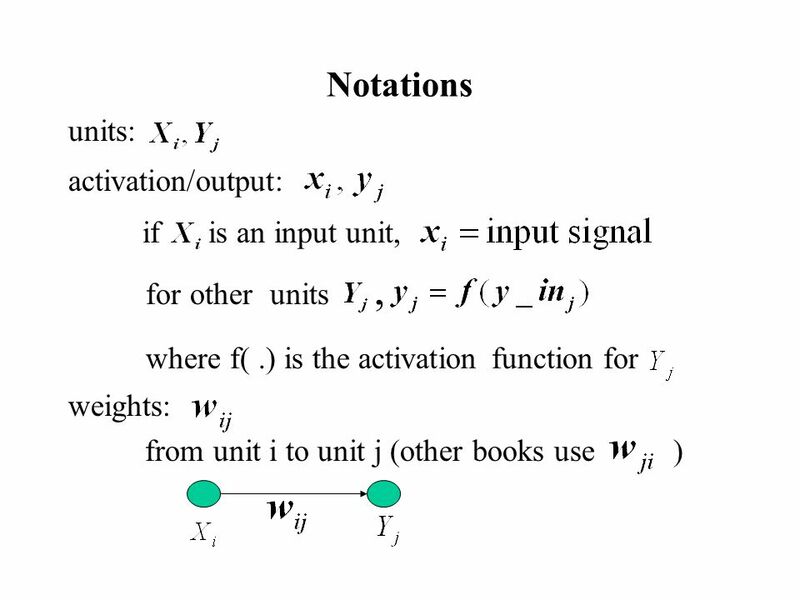 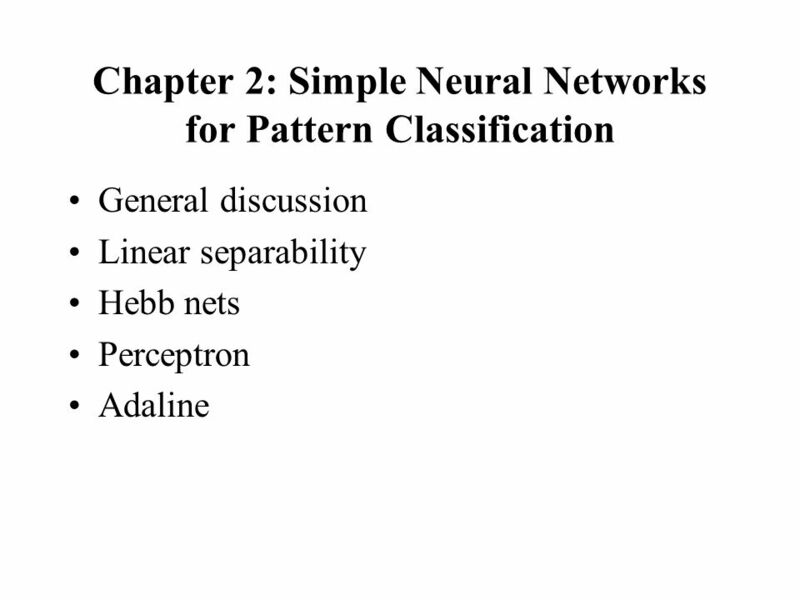 Download ppt "Introduction to Neural Networks Computing"
Navneet Goyal, BITS-Pilani Perceptrons. 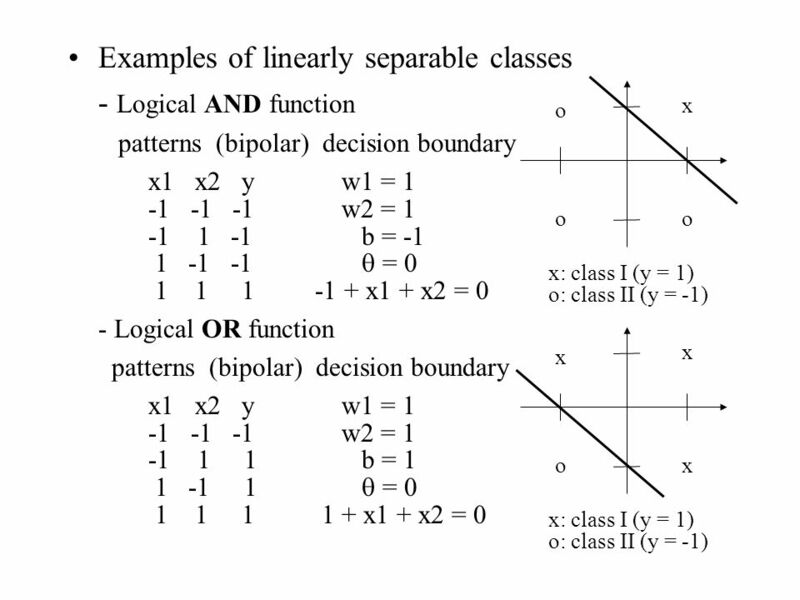 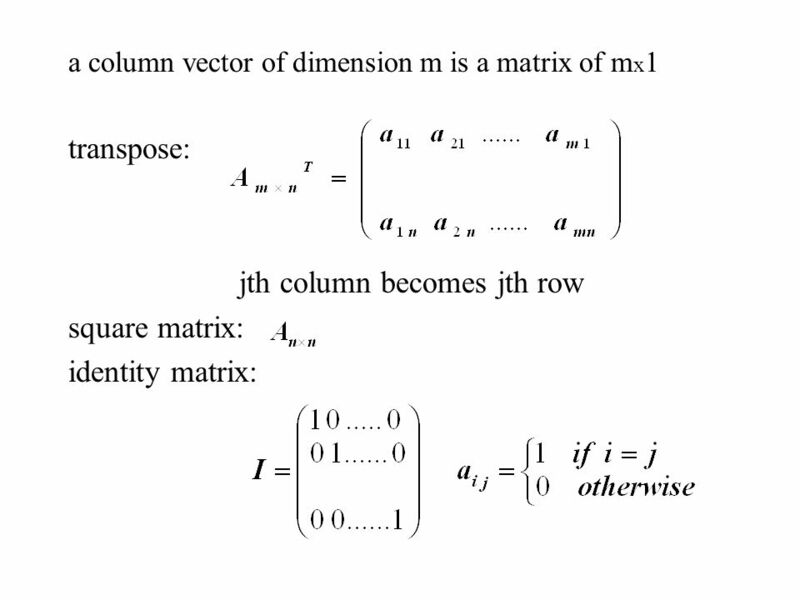 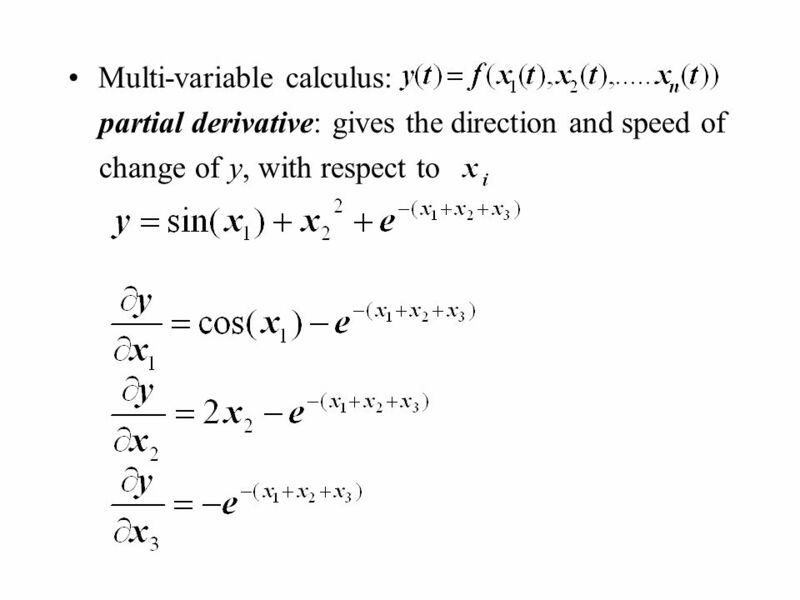 Labeled data is called Linearly Separable Data (LSD) if there is a linear decision boundary separating the classes. 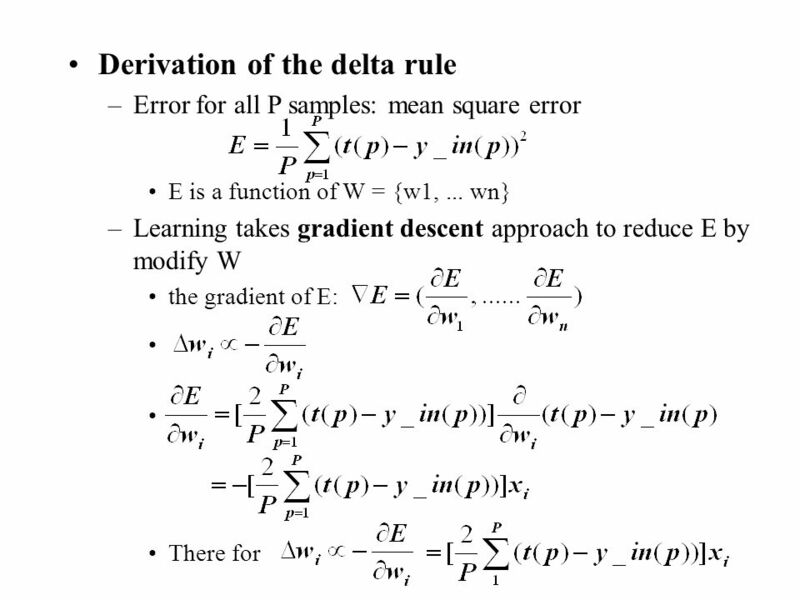 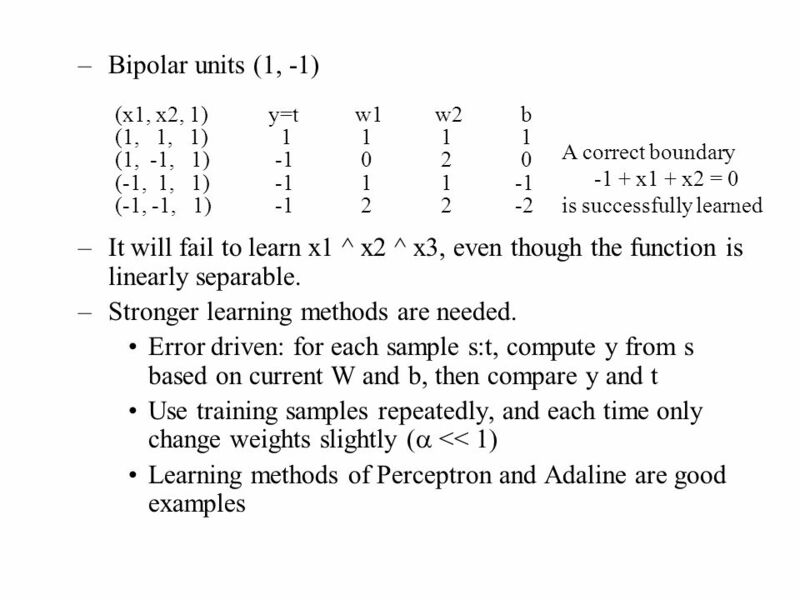 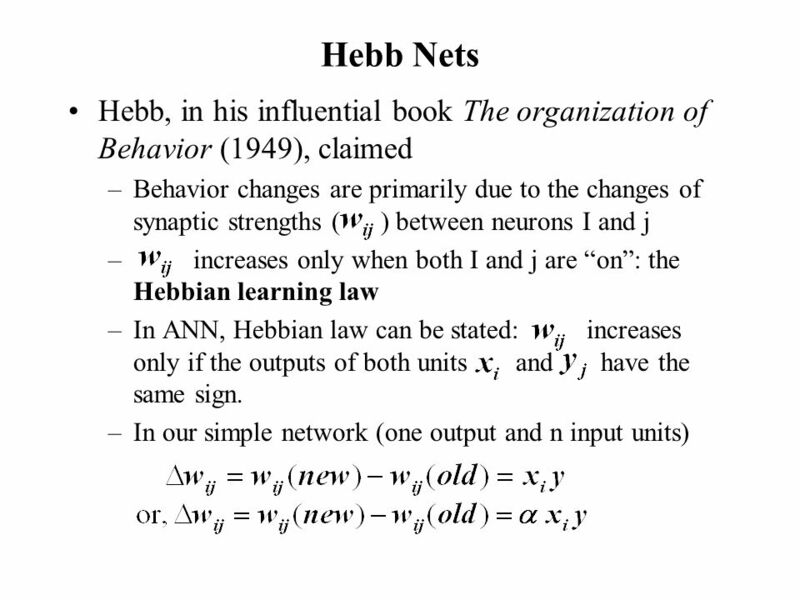 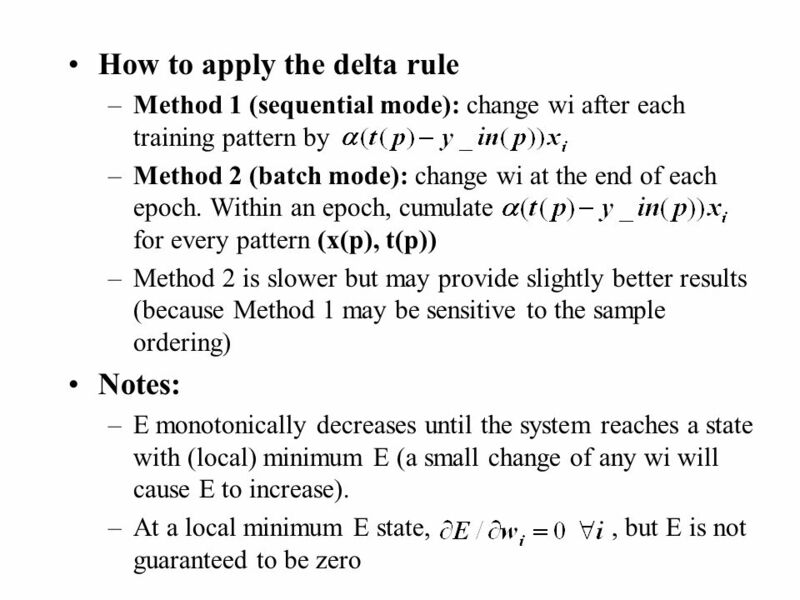 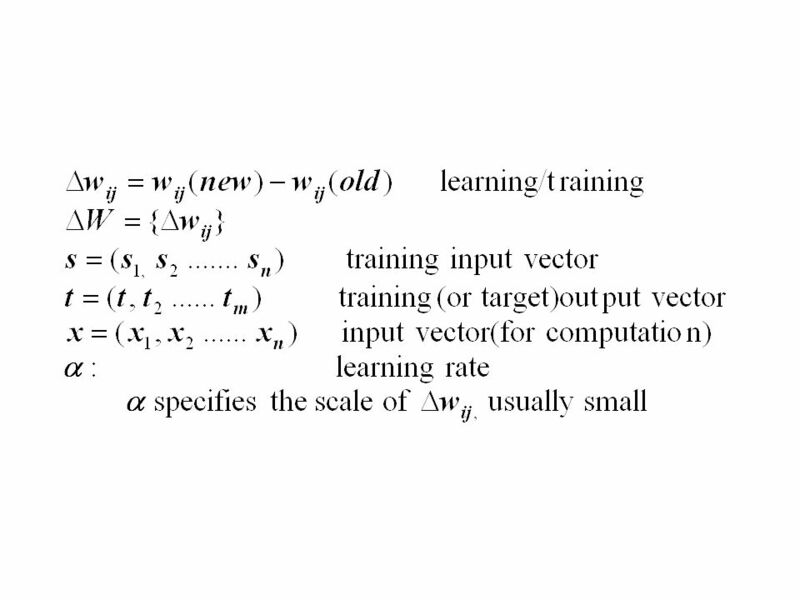 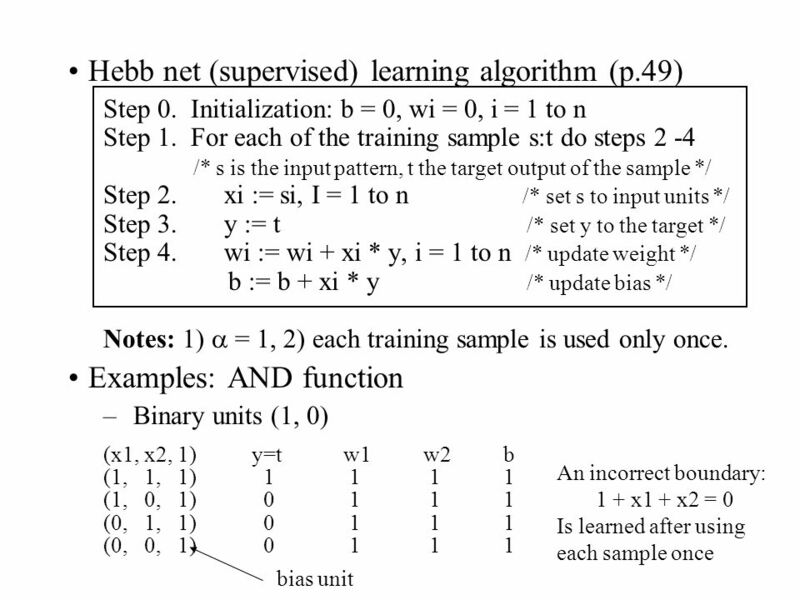 Supervised learning 1.Early learning algorithms 2.First order gradient methods 3.Second order gradient methods. 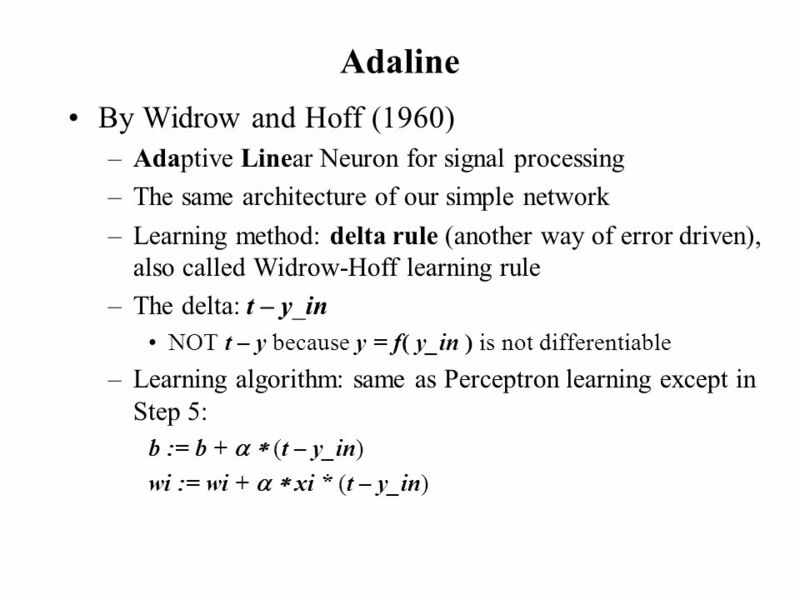 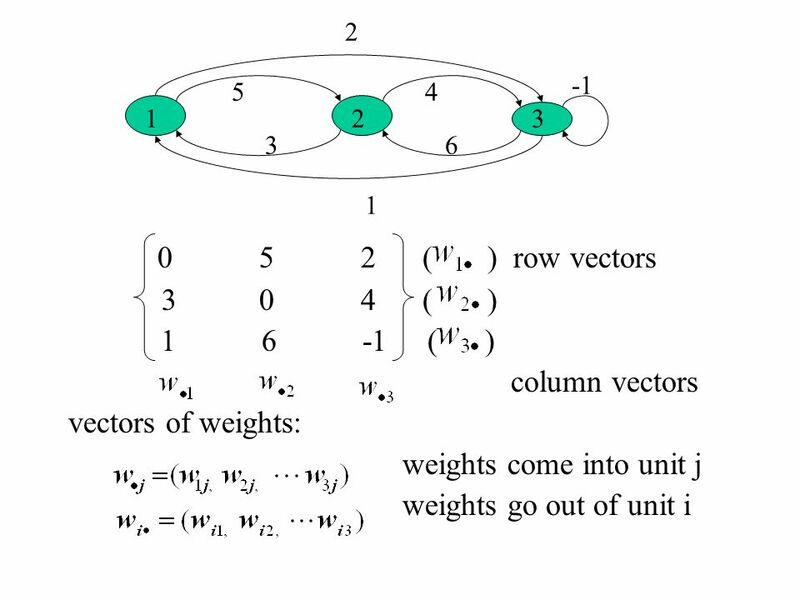 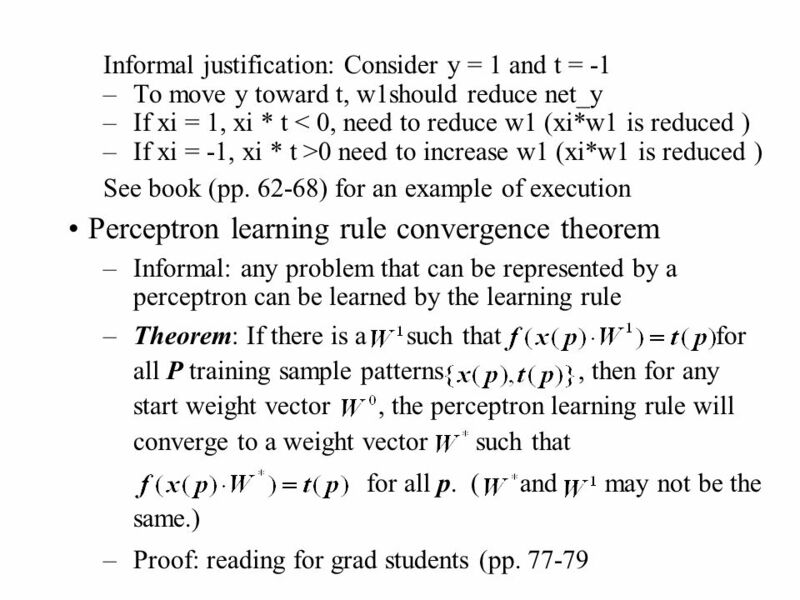 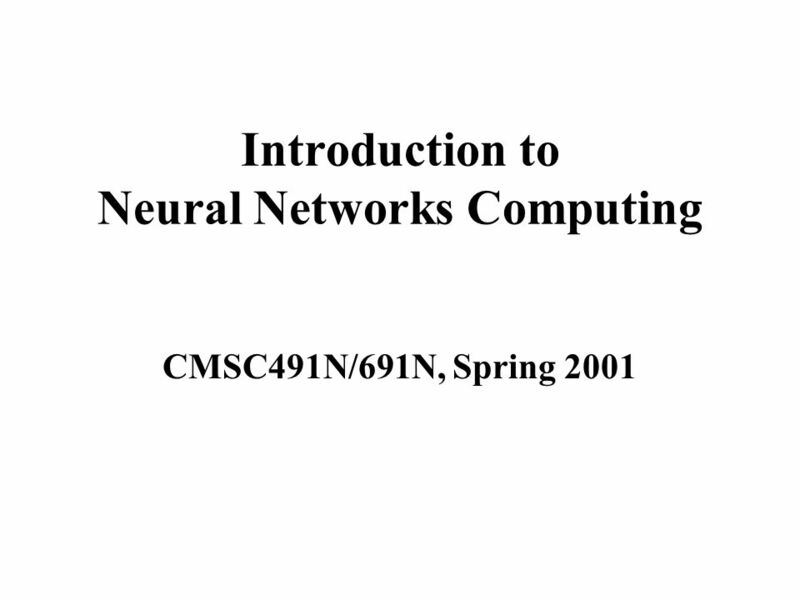 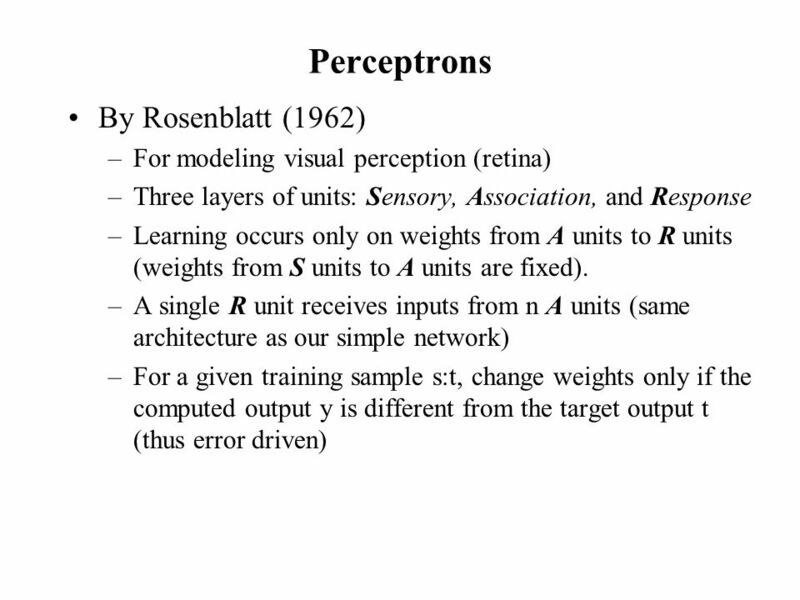 Introduction to Neural Networks John Paxton Montana State University Summer 2003.